* Annual estimated passenger usage based on sales of tickets in stated financial year(s) which end or originate at Falmouth Town from Office of Rail and Road statistics. Methodology may vary year on year. Wikimedia Commons has media related to Falmouth Town railway station. 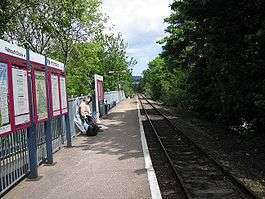 Falmouth Town station is the most central railway station in Falmouth, Cornwall, United Kingdom. It is on the Maritime Line, 11.75 miles (18.9 km) from Truro. It is unstaffed but operated, along with the trains, by Great Western Railway. Despite only being opened in 1970, the station has already been known by three different names: Falmouth, The Dell, and Falmouth Town. The station was opened as Falmouth by British Rail on 7 December 1970 when the branch line was cut back by 845 metres (924 yd) to terminate here. The platform was constructed using components from Perranporth Beach Halt which had closed in 1963. It was renamed The Dell on 5 May 1975 when the original Falmouth station was reopened, subsequently being renamed again, this time to Falmouth Town on 15 May 1989. There is just one platform on the north side of the line (the side nearest the town centre) reached by a ramp from the car park. Trains towards Truro run from left to right. The platform is constructed from concrete slabs and piers, and a metal and glass waiting shelter is provided. The station is close to the National Maritime Museum Cornwall, and is the closest serving station for Falmouth University's Woodlane Campus. Both are indicated on the station's signs. All trains on the Maritime Line are operated by Great Western Railway. They run seven days each week and, during weekday day time, operate every half-hour.